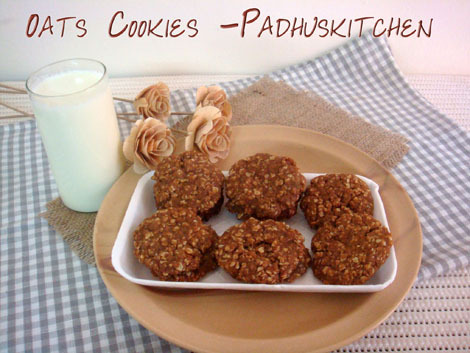 Oats Cookies with raisins are delicious, soft and chewy with the goodness of oats and raisins. I saw this on a TV show long time back and wanted to try it. It came out perfect and we all loved it very much. They make perfect tea time snacks.Kids and adults will love it very much.Today let us learn how to prepare Oats cookies using our easy Eggless Oats Cookies Recipe with raisins. Sieve all purpose flour and baking powder together. Keep it aside. Preheat the oven at 180 degree C for 10 minutes.Grease the baking tray and dust flour on it. In a bowl, cream together butter, sugar, milk and vanilla essence with a wooden ladle or an electric mixer until smooth. Now add the flour and the oats to the creamed mixture and fold until well incorporated. Add raisins and chopped walnuts (if you are using) and mix well. Take a small ball of dough and flatten it with your hands. Arrange it on the baking tray 2 inches apart as they will expand while cooking. Bake at 180 degree C until light golden brown at the edges and the bottom. The top will look soft and undercooked. Don't panic. Let it remain inside the oven for 3 minutes. Remove from oven after 3 minutes and let it cool. Transfer it to an air tight container. Note - If you are not able to make dough, you can add a little more milk. For Oats Cookies with eggs- replace milk with 1 egg. The baking time will vary depending on the type of oven. So watched carefully and see to it that it doesn't get burnt. Tasty and healthy cookies, looks very tempting. Delicious and healthy. Book marked to cook soon. I love oats cookies. I am buying it nowadays very often.Urs is looking yummy. I must try this soon. Bookmarked !! Wow!!! Yummy and so temPting!!! I am wondering where was i all this time tht i wasnt able to visit ur beautiful Space!!!! Cookies look very crisp & crunchy.......great recipe. can i bake it in cooker as how we do for making cake. i dont hav oven. Yes, you can bake cookies in cooker but do monitor while baking. Can u please tell me the time frame for baking in the cooker! Around 10-15 minutes. But you must keep an eye on it as cookies will get burnt quickly. Hi.. I tried these cookies and they came out yummy. I have a doubt though.. Is the brown sugar supposed to melt? I still feel it in the crunch of the baked cookies. Nice to know that they turned out well. Sugar will get mixed well and you will not feel it. Powder it before adding if using granulated brown sugar. Yes, you have to triple the quantity. You can also bake in batches.